Have you ever seen these neat circle or oval cutouts? 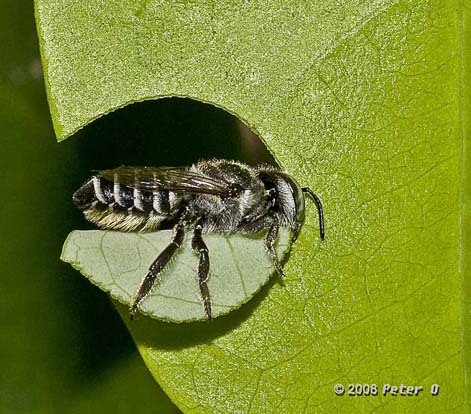 This is the work of solitary leaf-cutter bees, Megachile species. Females cut these very distinctive oval and/or circular pieces from soft leaves (in this case a rose) to make the egg cells of their nests. Erica Siegel's image (above) has captured an awesome close up of a leaf-cutter bee in action snipping a piece from a leaf. The powerful mandible or jaw used to do the cutting can be seen quite clearly. The nests are usually built in existing crevices such as window frames or hollow twigs and stems. 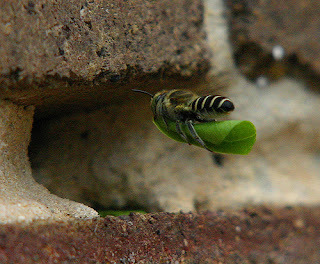 In the image to the left the bee is taking her construction material into a brickwork crevice grasping the curled leaf with her legs. The leaf-cutter bees use these leaf pieces to weave multiple egg chambers inside their nest burrows. The cell walls are made of overlapping leaf pieces and capped with circular pieces. Cells are placed one in front of the other until the cavity is filled. Each cell has an egg, a little bit of pollen, nectar and saliva for the further development of the larvae. In Peter O's image to the right you can see the stiff bristles or hairs underneath the abdomen. 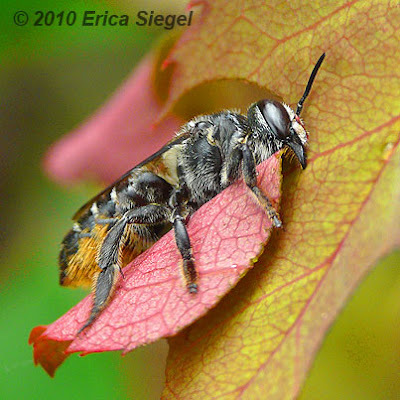 Unlike the honey bee which carries pollen on corbicula (special structures in the tibia of the hind leg) leaf-cutter bees carry pollen on scopa (elongated hairs on their abdomen). Although the leaves are unsightly these bees do not harm the plant. In fact the CSIRO have spent eight years of entomology research which has culminated in the establishment of quarantine import requirements of these bees. Why import them you ask? 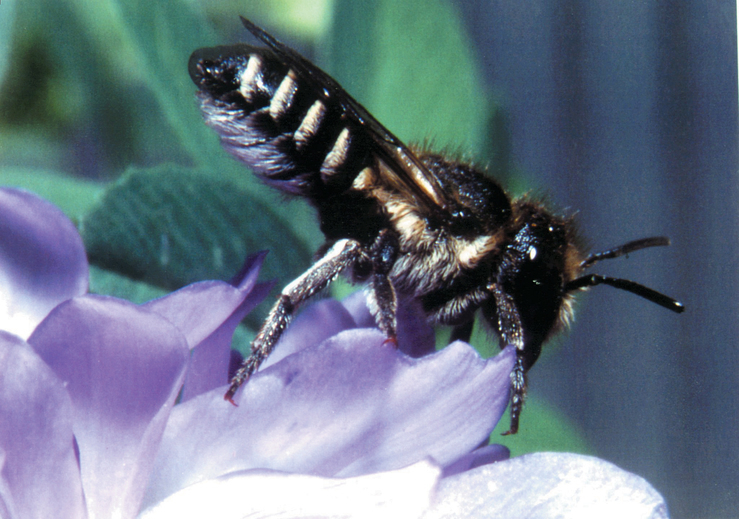 It has been found that leaf-cutter bees are better at pollinating lucerne crops than honey bees. For further reading this PDF from Farming Ahead will give more detail. These resourceful bees will take advantage of any crevice to provide a home for their larvae - be it in old garden gloves, sprinklers and hoses! I have yet to find where the bees have made their nests in our garden.